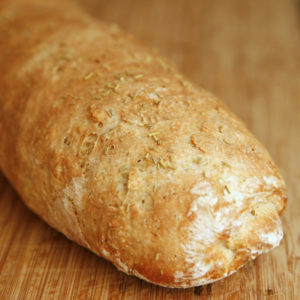 This fragrant homemade loaf is perfect for enjoying with soup. 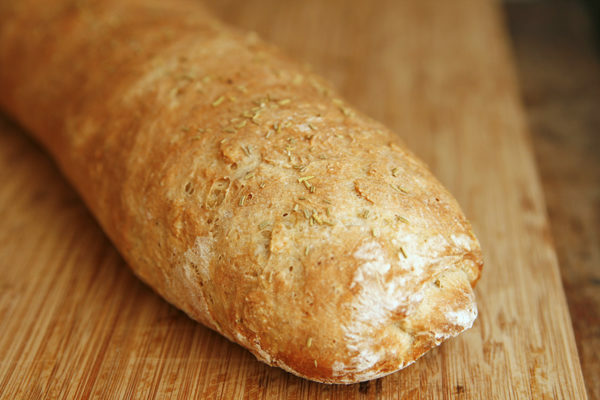 Why not make this Rosemary Garlic Baguette recipe today? I once fell in love with a road in Connecticut and all the houses along it. With views of the Long Island Sound, my favorite houses were beach front, set back a bit but still so close to the sand and water. I poured over real estate listings, determining that some homes were simply too big for me. I liked the ones that were more cottagey, close-ish to the water and with hardwood inside. I liked an airy feel with lots of windows facing the sand and surf, and an incredible kitchen. And it was okay if they were unrenovated, holdovers from a bygone time when that wasn’t one of richest towns in the state. One summer when that dream ballooned like a rising loaf of bread, I even drove down the road a few times, imagining. I could practically taste the life we’d have there. The kids would play on the beach every warm day of the year. I’d have my morning coffee on the back porch, overlooking the water. We’d eat al fresco style for as many days out of the year as the weather would allow. There would be swimming and fire pits and torches and cozy chairs in the sand that we wouldn’t have to put away when it was time to go inside. And I’d write there, with the sound of lapping waves as my background music. But then, Hurricane Sandy hit and washed it away — from the literal houses to the figurative dream. The October storm hit the Connecticut shoreline hard, leaving lawns and roads buried under thick layers of sand from the flooding, eight homes completely destroyed and countless others seriously damaged. That was a hard fall and winter. While Sandy took away the physical road I dreamt of living on, a series of hard events ended it altogether. My priorities shifted. The dream was so sweet and nice, and I would have been grateful to achieve it. But my kids needed more than sand castles every morning — and maybe I did too. These days, my dream is simpler. It’s a house with a yard and room for a library with cozy chairs and built in bookcases. It’s providing a good life for my kids, filled with the things they’re most interested in. It’s living well every day. That road in Connecticut popped into my head recently and I nostalgically looked through real estate listings one more time. There aren’t so many houses for sale on that road anymore — actually only a few. And they didn’t carry the same gravitas that they did when I first saw them years ago. As people, we change. Our needs, priorities and plans shift. And though some dreams do die, others can grow and take their place. I should note that my beach house dream didn’t include baking bread. But that’s a shift too, I guess. I’ve learned how much I like baking bread. The yeasty smell of dough, the way it rises, the technique that transforms it from blob to baguette … bread is both practical and purposeful. This recipe will take you a few hours. You start by mixing the dough — I like to do that in my stand mixer with the dough hook. It makes quick work of it. 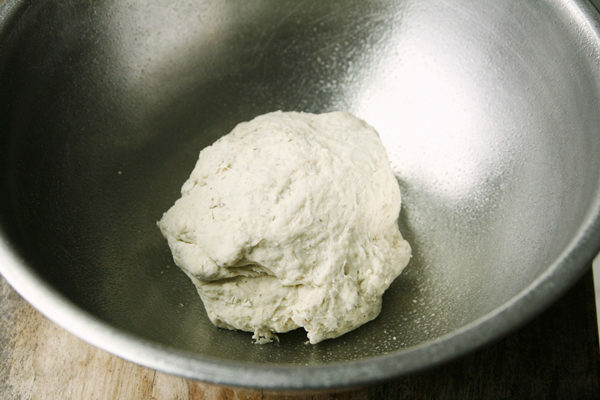 Then you let the dough rise in an oiled bowl, covered loosely and set in a warm place. It will double in size. 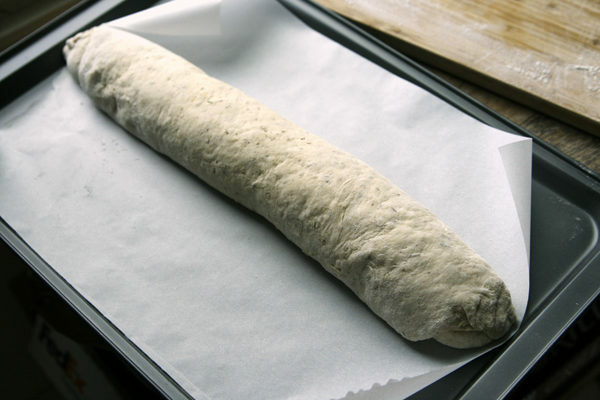 Next, you roll out the dough into a rectangle and then roll it into a long log — that’s how you get the baguette shape. The dough rises one more time, then you cut slits in it, brush it with glaze and sprinkle it with goodies before baking to perfection. Make sure you have your butter ready. In a bowl of a stand mixer, stir together the water, sugar and salt. Sprinkle with the yeast and let sit for a few minutes until it has all foamed. Stir together. Add the flour, rosemary, garlic powder and black pepper all at once. Using the dough hook, run the mixer on its lowest speed to incorporate and then scrape down the sides of the bowl and mix on medium until a ball of dough forms. 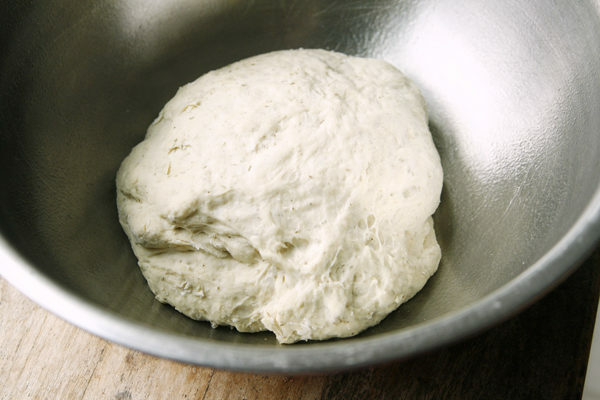 Transfer the dough to a large oiled bowl and cover. Set in a draft-free warm spot and allow to rise for at least one hour. It should double in size. 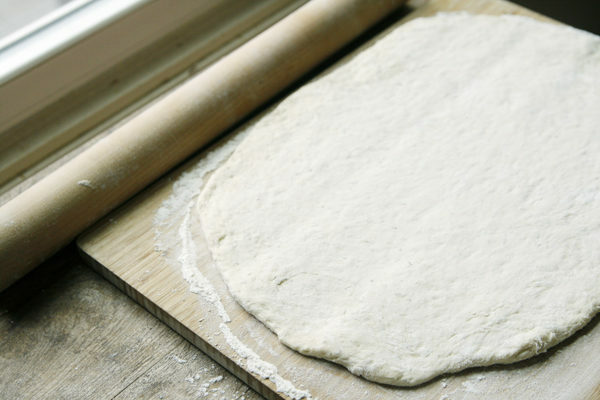 Transfer the dough to a floured board and roll into a rectangle. Hint: flour the dough and the rolling pin and keep a dough scraper handy. This dough will still be really sticky. 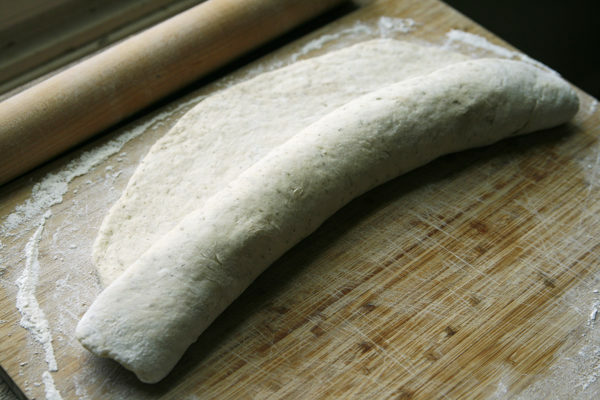 Once rolled out, roll the dough into a log along the long side. Taper the ends. 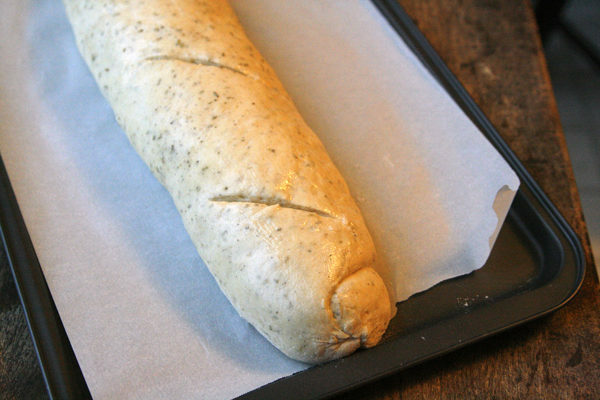 Place the loaf on a greased parchment-lined baking sheet. Cover with a clean kitchen towel, and set in a warm, draft-free place to rise for at least an hour, or until doubled in size. In a small bowl, stir together the glaze ingredients. Brush all over the loaf. Discard any unused glaze. Using a serrated knife, cut three diagonal slits in the top of the loaf. I find very few things as relaxing as baking bread.